Strong, stout stems bear a profusion of pretty white flowers with a pale pink blush. 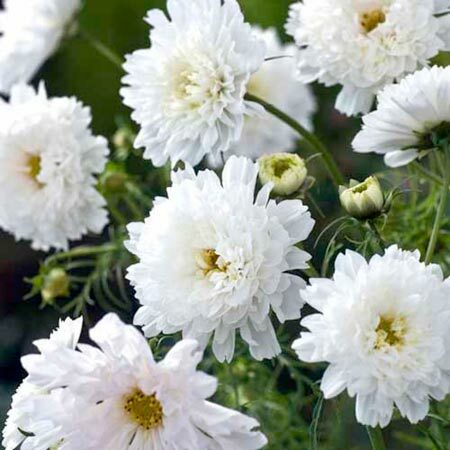 It has a "Sea Shells" type flower form (sometimes bearing singles and doubles on the same plant) and makes an enchanting cut flower. Cosmos has few equals as a ‘space filler’ for larger borders at an economical price. Large flowers are well held above attractive finely cut foliage. What’s more they make great cut flowers too. Height 60-90cm (24-36"). HHA/HA - Half-hardy annual/Hardy annual. Sow indoors and plant out for early flowering or sow direct outdoors in spring. Sow February-May to flower July-September. Suggested plant spacing 40-45cm (16-18"). Ideal for beds and bordes. Drought resistant. Prefers full sun.